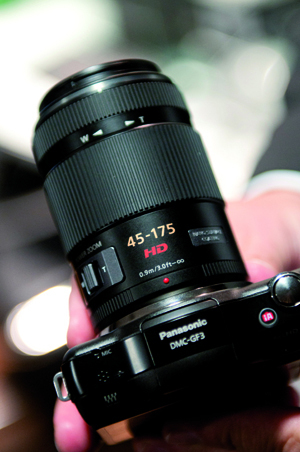 Panasonic has today unveiled a new lens range for its G-series products, featuring a micro four thirds mount. It has also unwrapped a new bridge camera, the DMC-FZ150. The Lumix-X lens brand will serve as the company?s premium range and sit between the standard and the Leica-branded models already available. Panasonic UK has told us that the X-range is not intended to replace the Leica lens line-up, but will feature some of the latest technology. To highlight this, the first two models feature a Power Zoom system, which controls the zoom and focus electronically. The 14-42mm f/3.5-5.6 lens is a collapsible zoom, reducing to the size of the 20mm pancake when not in use and extending out like a bridge camera lens when the unit is turned on. Zoom control is via a rocker lever on the side of the lens rather than a ring around the barrel and there is no on-lens focus control. This lens, Panasonic claims, will offer better performance than the current standard 14-42mm and will be packaged with the GF3 in kit form. The second lens is a 45-175mm f/4-5.6 telephoto zoom (pictured). Despite being smaller than Panasonic?s existing long zooms, this retains a zoom ring and focus ring (both with electronic connections) and also incorporates a zoom lever on the side. The lever is designed with video users in mind as it allows a smoother operation than turning the barrel while filming. Although it is not expected for all the Lumix X-series lenses to be of this type, the Power Zoom system is an interesting new direction for micro four thirds cameras. 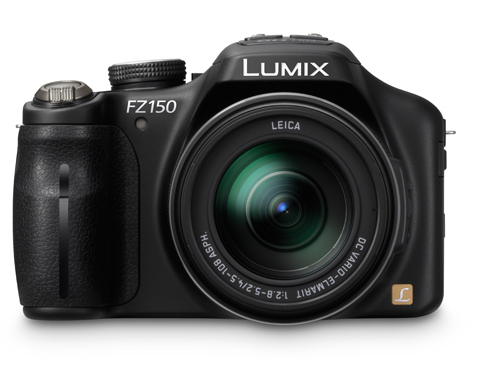 Meanwhile, Panasonic has announced a new flagship bridge camera in the shape of the Lumix DMC-FZ150 (pictured below). It features a 24x Leica DC Vario-Elmarit lens, delivering the 35mm viewing angle equivalent of a 25-600mm zoom, says Panasonic. The FZ150 houses a new 12.1MP sensor and 12 frames per second mechanical shutter. Panasonic claims that the camera?s signal-to-noise ratio is superior to its predecessor, the FZ100, marking an improvement equivalent to ?4.7 decibels? (at ISO 1600). The newly-added Creative Control mode includes expressive, retro and sepia options. The FZ150 also sports a hotshoe for attaching accessories such as an optional stereo microphone (DMW-MS1), compatible flash units such as the DMW-FL220; or remote shutter (DMW-RSL1). It can also shoot images for viewing in 3D on a compatible TV. The FZ150 is due out in October priced £449.99. In a separate move, Panasonic has added Wi-Fi connectivity to another new compact camera, the 12.1MP DMC-FX90. Priced £269.99, and also due out in October, the FX-90 features a dedicated Wi-Fi button. This should allow connection through a phone, PC or hotspot to the Panasonic Cloud, and uploading to various social networking sites. The move coincides with the announcement of a new photo sharing service from Panasonic called Lumix Club. Lumix Club will include a link that aims to allow users to upload photos to several websites at the same time, with a single operation. Websites set to be linked to the service from 5 September are Facebook, Flickr, Picasa and YouTube. Planned future benefits for Lumix Club users include a photo storage and album service, according to Panasonic.